Bull Sharks in the Gold Coast Seaway – Should I be worried? 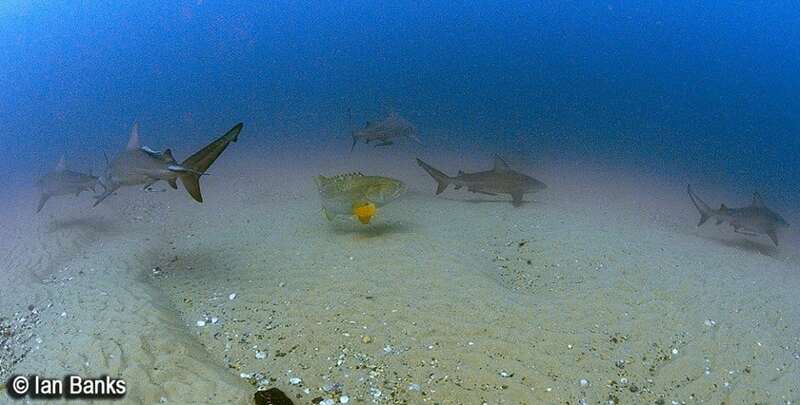 This picture has been taken in the Gold Coast Seaway by Ian Banks from Diving the Gold Coast. It reminded us that approximately 20 surfers in average paddle across the Gold Coast Seaway each day right over the spot where this picture was taken. It’s a common spot where bull sharks happily hang out. We are not aware of any recorded shark attack in this area over the last decades which gets to show that the presence of sharks does not necessarily mean danger to humans. It’s a big ocean and sharks are there all the time, busy with all the things that sharks usually do all day long. Hunting for humans is not one these things. Shark attacks are accidents, often due to mistaken identity and very very rare in the scheme of things. We will not get into the detail surrounding the shark net debate, however it is one more opportunity to express that shark nets have no purpose and are a psychological measure to take away the fear from tourist that our media has created. The post Bull Sharks in the Gold Coast Seaway – Should I be worried? appeared first on Gold Coast Dive Adventures.